Last time, we learned about using the Publicize feature to share your own WordPress blog posts on your social media platforms. Today we’re going to learn about adding sharing buttons to your posts to enable and encourage your readers to share links to your blog posts on whatever social media services they use. 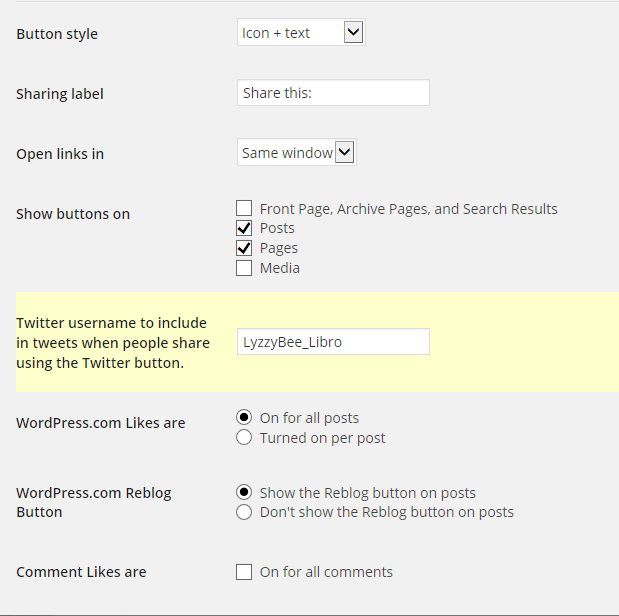 Why should I add sharing buttons to my blog posts? You write a blog in order for it to be read, otherwise, why bother. It’s human nature to want to share interesting things you’ve read with other people, whether that takes the form of lending them books, cutting out bits from the newspaper to wave at people, or sharing content on Facebook, Twitter and other social media platforms. By adding sharing buttons, you will both encourage and enable your users to share your posts, increasing their reputations as people who share good stuff, and increasing your reader base. What do sharing buttons look like? Here’s an example of a blog post without any sharing buttons. As standard, WordPress adds a button to “Like” a post (which just alerts you and makes a nice little line of pictures under your post, but doesn’t share anything) and a Reblog button which allows another WordPress user to share the post on their blog, with an excerpt of the content and a link to the rest of it. Other than these, there are no ways to share this blog post at present. You can even turn this off if you want to, see the Advanced Features heading below for more information. 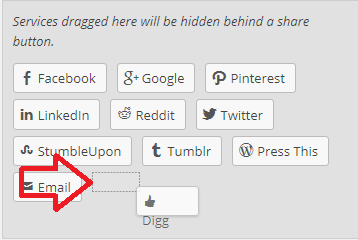 How do I add sharing buttons to my blog posts? Here’s an important point to note: When choosing which buttons to display under your blog posts, don’t think of what social media you use, but what social media your audience – your users – might want to use. They’re the ones who are going to be doing the sharing, after all. So don’t limit them – I’d add as many as possible if I were you! Here, I’ve moved everything except for Print and Pocket down into the Enabled Services section. You can, of course, drag any buttons that you don’t want to be visible back up to the Available Services section. You might find this a bit cluttered: there is a way to just display a single Share button that displays the whole range when pressed. However, I feel that this might present a barrier to sharing, and you want all the sharing you can get, so think carefully before doing this. How do I change the order in which the sharing buttons appear? Button Style allows you to select icon + text / text only / icon only / official button. Note that official button doesn’t always work as services change: I prefer icon + text which is what I’ve used in all of the examples on this post. Sharing label: you can change the text above your sharing buttons from “Share this” to whatever you want to say to encourage people to share. Open links in offers the choice of same window and new window – most people prefer to work in the same window nowadays. Show buttons on allows you to choose what people can share – search results, individual posts, etc. Twitter username will appear in tweets when people share using the Twitter button. It’s useful to include your Twitter ID here so you can keep an eye on what’s being shared – if you have multiple blog administrators, you might want to use an official company or organisation Twitter ID here instead. Likes can be turned on or turned on for individual posts. The reblog button can be turned off. 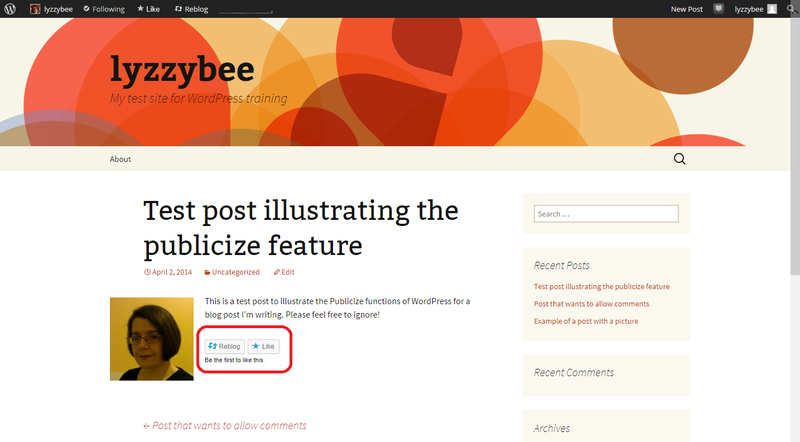 What happens when someone clicks on a sharing button in your WordPress post? Press Share Link and the link will share on your Facebook timeline. What does content shared using the sharing buttons look like? 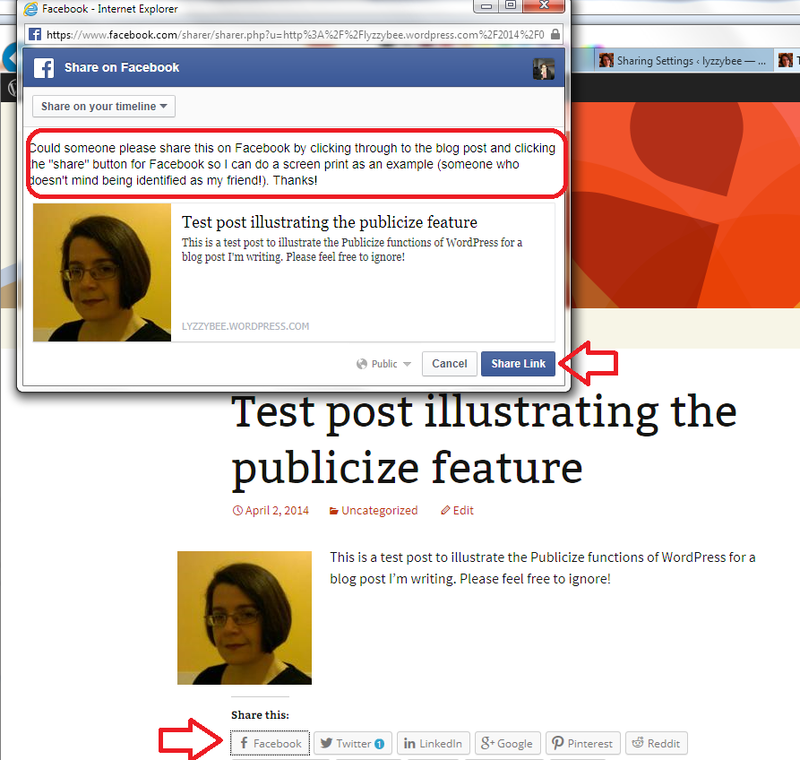 Let’s have a look at what content shared from your blog might look like on a couple of social media platforms. Here’s my shared post appearing on my Facebook timeline because my friends Gill and Jeremy have shared it. Just like those shared links you see all the time on your timeline. If your friends share your link, you should see it come up in your own timeline. And here’s what a Twitter share or two looks like. You can see that “via LyzzyBee_Libro” has been added to the end of the automatic tweet because that’s the Twitter ID I specified above. Today we’ve learnt how to add and edit sharing buttons on a WordPress blog to enable and encourage blog readers to share our posts. If you’ve enjoyed this post and found it useful, do please comment and/or use the sharing buttons below this post to share it with other potential readers who might find it useful. Thank you! I had a question: My http://www.keepingupwithmrssmith.wordpress.com blog does not show the “Reblog” “Comment” or “Like” buttons along the bottom of the post as is it displayed in the Reader. How do I get those buttons typically shown in the WP REader to turn on? Thanks! Thanks for your question. First of all, are you using WordPress.com or self-hosted WordPress? If the latter Google WordPress widget and the names of the buttons and find and install the appropriate widget. If you are on WordPress.com then have you tried the steps in this blog post? Thanks for the speedy reply, Liz! 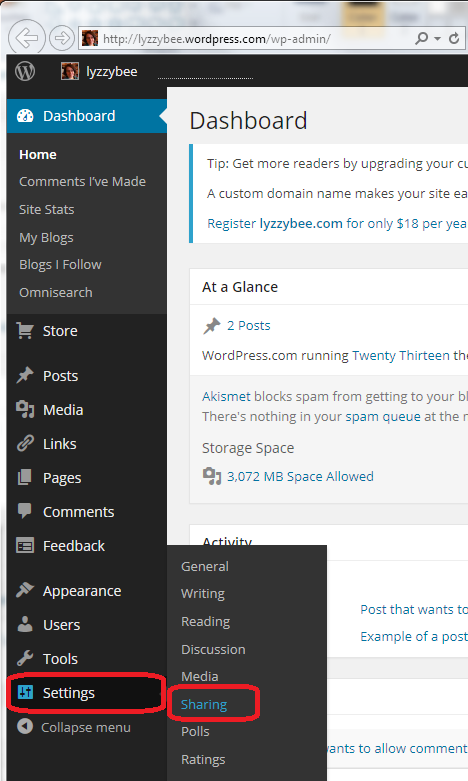 Well, I started out with a free WP blog that I closed so that I could go self-hosted(I use Dreamhost, not WP). Then I decided to try a rate-boosting experiment by getting a free WP site using the same name as my self-hosted site. There I write bits of the posts and then have readers follow a link to my self-hosted site to finish reading the post. So I was wondering if the reader knew I was self-hosted and blocked the buttons. Ah yes, the buttons don’t appear on the self hosted site but if you add the widget then they will appear there and in the reader too. If you do add a widget, do write a blog post about it and send me the link or do a guest post for me on it! Well, after some reading, I discovered that WP knows if you’re self-hosted and will leave out the buttons. Even if I am sharing my self-hosted link via my wp.com site. Interesting – but I presume that if you add the widget to your self-hosted blog, all will be fine. Do let me know! Thank you so much for your helpful posts! I am having an issue now that wordpress has a new version. I do not see the “sharing” button under settings. Is there another place I could find it? You’re welcome. 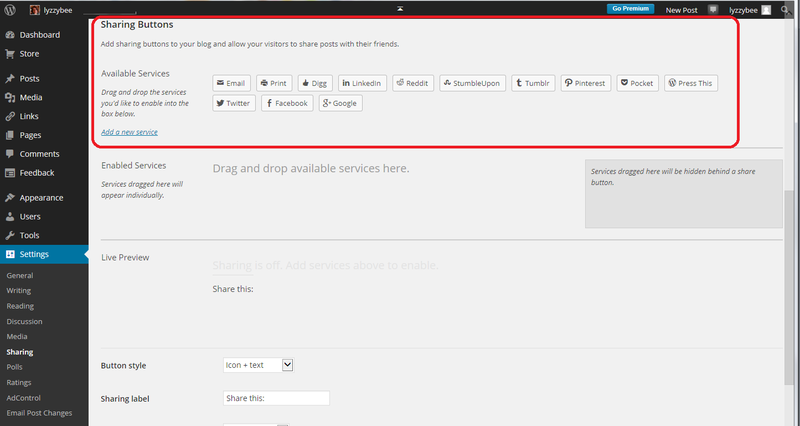 Are you using self-hosted WordPress or WordPress.com as I can still see the sharing option under settings. You might have to download a sharing widget if you’re self-hosted. Hope that helps! 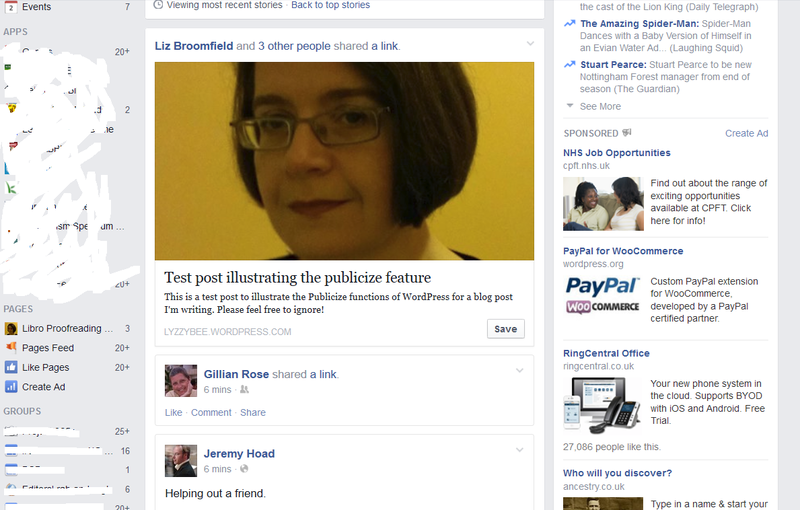 Liz, would you happen to know how to get the ‘press this’ share button on my blog? Since I self-host I can’t use the ‘reblog’ and ‘repost’ has been discontinued. I use ‘press this’ tool to clip blogs I like to reblog, but my followers are always asking why I don’t have a reblog button? If you’re self-hosted, you’ll need to get a widget to do that, and I’m afraid I’m not an expert on that. Google widget press this and the theme you’re using and that should help you to find something. Hope that helps start you off! Hello I had been having some issues and did not realize that I never received a reblog though I’ve given out lots. I had it turned on but it wasn’t displaying. I added the buttons properly and I can see it within the actual post only not if I go to the home button. Some of my followers have it where their whole site comes up as one I can see their sharing and reblog without having to click the post. Is that a separate thing I have to set up. If you could please check the it out and advise me and you should be able to email me directly. Thanks for your question, Paul – can I just check, are you using wordpress.com or self-hosted WordPress? If it’s self-hosted, you may need to try a new widget – that’s outside the scope of my blog and advice at the moment, however. Also, what happens if you change to a different theme – does it display then? I’ve found some themes don’t display certain features however much you try. That’s two things to try – do let me know how you get on. Hi Liz I am on the .com version. I changed themes 3 times over the 4 plus months since I strated and did not get a single reblog. I reblog others. I looked on my mac mini and it was not there even if I clicked a post on any browser or on my iphone. I looked at my forums and pages including yours. My settings are correct. I added press this and a couple of other buttons to my site. Then on my computer I could see it on firefox if I press the post, but not on safari and on safari on my iphone but not on chrome or firefox. I asked others and most said they could not see it. 2 people also with a mac mini and Iphone had the opposite results than what I had. I was told by WP it is a known bug but it should not be that bad. That is why I reached out to you. I typically use my computer and firefox for most things. I do have the app on my phone but barely use it. Sorry for any possible errors or paragraphs, I am real late on heading out the door. If you can think of anything feel free to let me know.